Books Ireland is available in both print and digital format. Click here to subscribe. Margaret Bonass Madden on the importance of honest reviewing. Tony Canavan with news from the world of books. John Kirkaldy recently spent a day at Oscar Wilde’s grave in Paris. 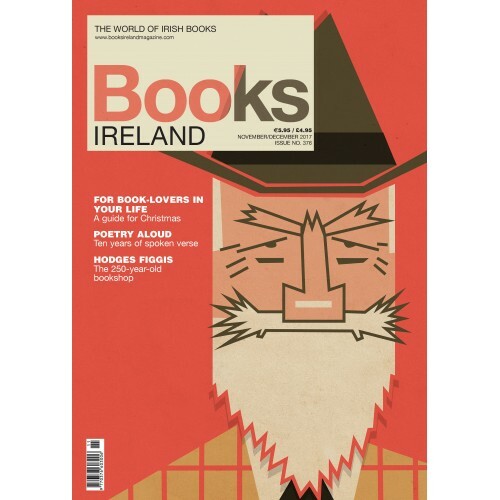 Bríd O’Sullivan looks back on ten years of Poetry Aloud. Some ideas for the perfect gift for the book-lover in your life. Tony Canavan on the film version of James Joyce’s take on Christmas, The Dead. Liam Donnelly celebrates 250 years of the Hodges Figgis bookshop. John Gibney assesses the newly published Atlas of the Irish Revolution. Laurence Fenton looks deeper into F. Scott Fitzgerald’s Irishness. Hugh McFadden—Joyce in Court: James Joyce and the law, by Adrian Hardiman. Lavinia Greacen—Masquerade: treason, the Holocaust and an Irish imposter, by Mark M. Hull and Vera Moynes. Kevin Kiely—Balkan Essays, by Hubert Butler. Eimear Goggin—In Sight of Yellow Mountain: a year in the Irish countryside, by Philip Judge. Síne Quinn—The Ludlow Ladies Society, by Ann O’Loughlin. Marjorie Quarton—To Raise the Fallen: a selection of the war letters, prayers and spiritual writings of Fr Willie Doyle SJ, edited by Patrick Kenny. Tony Canavan—Come Day—Go Day, by John O’Connor. Aubrey Malone—Policing Hong Kong: an Irish history, by Patricia O’Sullivan. Peter Pearson—Castle Hyde: the changing fortunes of an Irish country house, by Terence Dooley. Carina McNally—The Cottingley Secret, by Hazel Gaynor. Anne Cunningham—King Goshawk and the Birds, by Eimar O’Duffy. (P) Anne O’Leary—‘Slight Return’: Paul Muldoon’s poetics of place, by Anne Karhio. Cathal Póirtéir with his selection of recently published books as Gaeilge. Sue Leonard takes her pick of the latest books by début authors. Paula O’Hare casts a critical eye over newly published crime fiction. Tony Canavan’s listing of all the books published in or about Ireland in the last two months. Anthony Cannon muses on his favourite place to write in London.